New Anthem Video Breaks Down Story, Progression and Customization | Nerd Much? If you’ve been in the dark about BioWare’s Anthem, you’re officially in luck. The studio is releasing a string of new videos showcasing exactly how everything works. With the first new Anthem video covering the story, progression and customization at your disposal in the game. As “part explorer, protector, and adventurer”, you and your friends comprise an elite group known as Freelancers. You’re sworn to protect humanity and uncover all of the mysteries within Anthem’s world. 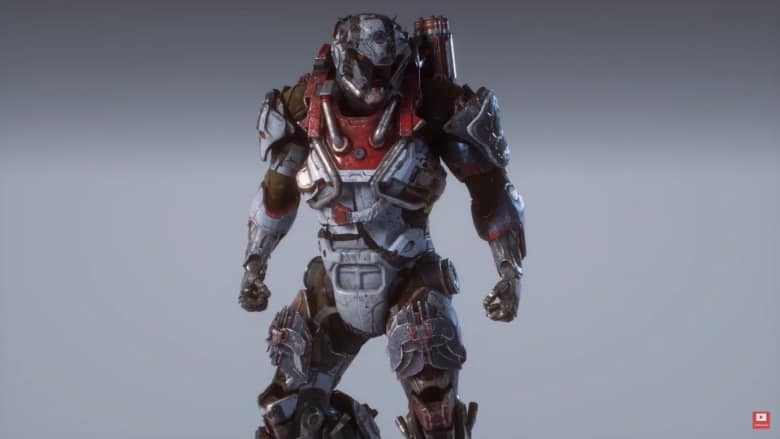 As for the Javelin’s themselves, there are four classes: Storm, Ranger, Colossus and Interceptor. Storm uses elemental attacks. Ranger is the well-rounded gunner. Colossus is the heavy, up close and personal class. And the Interceptor is swift and deadly with its quick hit and retreat tactics. No matter which class of Javelin you choose, you’ll have a ton of options to customized it with the many loadouts at your disposal. No matter what gameplay style you prefer, you’ll likely find weapon options that suit your various needs. You’ll also be able to tweak the design of your Javelin too, ensuring you look as fresh as you are deadly. BioWare then takes time within the Anthem video to showcase how different loadouts can be utilized properly in different battle scenarios. You’ll be able to customize your weapon options between each mission, so you’ll never be thrust into a mismatch. The new Anthem video showcases your mission options within the game too. You can continue critical story missions, pick-up side quests from NPCs, try to take down various strongholds throughout the world, or just mess around and explore the map in freeplay. If you’re intrigued by BioWare’s latest but you’re just not sure if it’s for you, checkout the six minute clip above to get a great feel for what to expect. The game launches on PlayStation 4, Xbox One and PC on February 22nd.